This torque calculator helps you find the torque arising in a rotating object. What exactly is this torque? Imagine an object that can rotate around some point, called the pivot point. If you exert a force at some distance from the pivot point, then even though the force will act along a straight line, the object will begin to rotate. Continue reading if you want to learn how to calculate torque and have the torque formula explained in detail. τis the torque. The units of torque are newton-meters (symbol: Nm). Imagine that you try to open a door. The pivot point is simply where the hinges are located. The closer you are to the hinges, the bigger force you must use. If you use the handle, though, the lever arm will increase and the door will open with less force exerted. Do not confuse this concept with the centrifugal force - the centrifugal force is directed towards the pivot point, parallel to the lever arm. Such a force doesn't cause torque (you can check it, substituting an angle of 0° into the torque formula). Start with determining the force acting on the object. Let's assume that F = 120 N.
Decide on the lever arm length. In our example, r = 0.5 m.
Choose the angle between the force vector and lever arm. If it is not equal to the default 90°, open the advanced mode of the calculator to change it. We will assume Θ = 90°. Enter these values into our torque calculator. It uses the torque equation: τ = r * F * sinΘ = 0.5 * 120 * sin(90°) = 60 Nm. 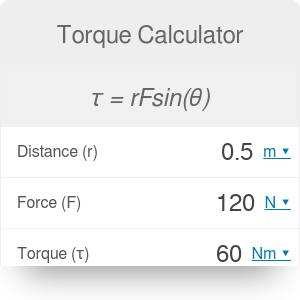 The torque calculator can also work in reverse, finding the force or lever arm if torque is given. If you want to learn more about the concept of force and Newton's second law, try the acceleration calculator. Torque Calculator can be embedded on your website to enrich the content you wrote and make it easier for your visitors to understand your message.